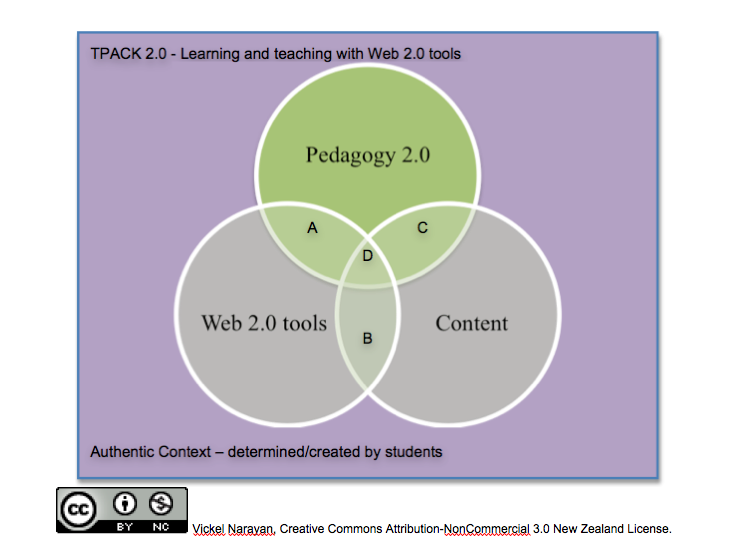 The TPACK 2.0 framework proposed emerged from literature reviewed on learning and teaching in the Web 2.0 world as a part of a my master thesis. 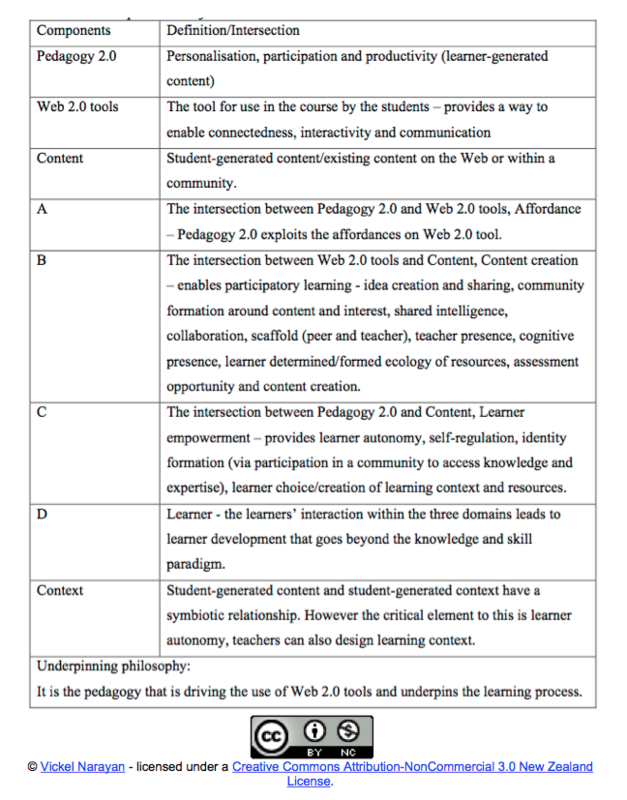 The literature reviewed considered the learner, the types of pedagogy and how the affordances of Web 2.0 tools enable a learning environment that allows learners to take ‘charge’ of their own learning. Learning is described as not just about gaining knowledge and skill but also about learning that allows learner autonomy and ownership. Learning is also considered to be where the learner is actively engaged in the process unlike the learning that occurs in most classrooms and higher education institutes where learning occurs by the ‘stand and deliver’ and ‘sit and listen’ model. This theoretical framework (TPACK 2.0) is based on: (i) the learner and learning domain (Bloom et al., 1956) , (ii) the pedagogies that drive the learning process and (iii) how technology (Web 2.0 tools) have impacted both, the learner and pedagogies. The table below outlines the themes that emerged (colour coded) from the literature reviewed. The table above outlines the three factors that play an important role in learning and teaching in a digital age, (i) pedagogy, (ii) Web 2.0 tools (affordances) and (iii) the learner. While the third critical factor in the table is the ‘learner’, the researcher however argues that it is the learners’ interaction with the content that is provided or the content that they create that leads to the creation of new meanings and understanding in the correct contextual setting and could also lead to the formation of identity (McLoughlin & Lee, 2008c; Wenger, 1998). The researcher grounds this argument in the work done by McLoughlin and Lee (2008c) who proposed the 3ps of learning (participation, personalisation and productivity) in the digital networked world where learning is the product of students creating their own content in the process of learning, a shift away from teacher provided content. The affordance of the digitally networked world also provides an opportunity for the learner to participate in (‘legitimate peripheral participation’ (Lave & Wenger, 1991)) or form communities of practice that leads to the formation of identity. This framework is also grounded on the notion of Learner-generated context (Luckin, 2008; Luckin, et al., 2007; Luckin, Clark, et al., 2008; Luckin, Logan, et al., 2008). The researcher calls this framework, TPACK 2.0 to formally acknowledge that it stems from the work done by Mishra and Koehler (2006), who proposed the TPACK model that also has three components (i) technology, (ii) pedagogy and (iii) content.